Do you have a property that is just sitting on the MLS? Time and money are crucial factors when you need to sell your house in Weatherford. It happens quite often, and there are usually similar reasons why it isn’t generating the interest you would like to see. 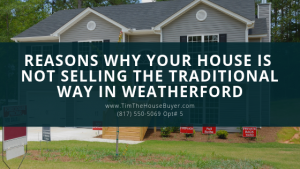 In our latest post, we will help you figure out why your house is not selling the traditional way in Weatherford and what you can do about it. Let’s dive into just how you can sell your local Weatherford house fast and get cash for homes in the process without having to list your house with a real estate agent, or having to wait months for it to sell. Be sure to scroll down and watch the short video we created for you on how we can help you sell your house fast in Weatherford and nearby cities. You need to market your house to people for whom buying a house with cash is the actual goal (not just tire kickers), get them in the door, and then close the deal. However, a listing can be bad in several ways. The biggest one we see is bad pictures. People don’t want to see other peoples clutter plain and simple. While you might be able to remove all of your possessions for the photos, at least do a good cleaning! We have seen people use photos with piles of laundry on their beds and dishes in the sink. Make the effort to get your property in the best condition for your listing photos. You see it time and time again… bad photos can ruin a houses chance of being sold. The listing can also be bad if there is bad if it has a poor write up. It should clearly describe the house without sounding phony or like all the other listings out there. It should capture attention while clearly outlining what to expect with the property. With a direct sale to Tim The House Buyer, you won’t have to worry about bad listings or even having to market the property. We will buy it as-is, mess and all. Many local Weatherford TX home sellers fail to sell their houses fast because they are asking too much, or not ready to sell, or both. Pricing your house correctly is probably the best step you can take toward making a fast sale for cash because it’s what gets people to consider your house in the first place. While most agents will be honest about what your house will sell for, there are others who will inflate the asking price in order to get you to sign a listing agreement. Do the research yourself and get multiple options as to the value of your house. Look at what other homes have sold for, not just ones that are currently listed. Factor in the repair costs, and be objective in your pricing. When you list too high, the property will sit there, eventually having to be lowered in price. This will push your listing to the bottom and make people wonder if there is something wrong with it because it has been on the market for so long. If it sits on the MLS for any period of time, the amount you are paying taxes, utilities, insurance, and maintenance can add up. By selling your home quickly, you will be able to keep a considerable amount of cash in your pocket. If you need to sell your Weatherford TX house fast… there are local professional home buying companies who pay cash for homes in Weatherford TX and many of them can close very quickly without contingencies. At TMC Property Solutions we offer cash for houses in Weatherford and the surrounding area. We’re local house buyers helping local homeowners sell their house quickly since the year 2000 with no closing costs, no commissions, no hassles. It always pays to sweeten the deal to make it more attractive for buyers. The tried-and-true principle of reciprocity tells us that people are willing to give more (sale price) if they feel they are getting something in return (the deal sweeteners). Most people looking for a house will want it to be turnkey. Moving is hard enough and if they are planning on living in the house right away, the last thing they will want to deal with is a massive renovation or project. One way to get around this is to offer a credit for repairs. This can grab people’s attention as they will have the freedom to customize things as they would like. To avoid making repairs or offering buyers a credit, consider selling your home directly. While there are many excellent agents out there, not all of them are as great as they would like you to think. Some are inexperienced and will give you poor advice. Others will not know how to properly market your property. And others will simply be lazy and not respond to potential buyers in time. Many sellers kick themselves for signing a listing agreement with an agent, then ending up having to do much of the work themselves… still having to pay the agent’s commission. With a direct offer from Tim The House Buyer, there are no contracts. We make you an offer and you decide if its right for you. There is never any obligation. Consider your options and make the decision that works best for you! Our team is ready to help answer any questions you may have! Or fill out our short form to see if your property qualifies for a fast-fair all-cash offer. TMC Property Solutions is an accredited business and A+ rated members of the Fort Worth BBB and has been offering home seller solutions all across Dallas Fort Worth since the year 2000. 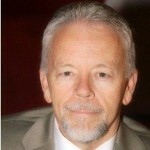 Please Google TMC Property Solutions to see what others have to say about our services.